Village signs is a series of caches based on the ornate signs that depict the heritage, history and culture of the villages that put them up (normally on the village green). The name Hayes is recorded from 1177 as hoese from the Anglo-Saxon meaning "a settlement in open land overgrown with shrubs and rough bushes". The village stood at the junction of Hayes Lane, leading north to Bromley, and what is now known as Pickhurst Lane, leading west to West Wickham. The village school was here, as is the parish church of St Mary the Virgin. Both William Pitt the Elder, 1st Earl of Chatham (1708–1778), and William Pitt the Younger (1759–1806) lived at Hayes Place, which was demolished in 1933 and the site redeveloped. Hayes became significant a little over a century ago, when Hayes became a popular place in which to live because bankers, stockbrokers and those who were "something in the City" bought property in the area. Between 1801, when the population was just 382, and 1921, it had almost tripled to 1010. Throughout the 20th century the Hayes village area continued to grow and thrive, with further commercial development on Station approach in response to the increased traffic through the railway terminus driving an incentive for growth. Much of the area to the west and north-west of the original village has been taken over by suburbia. 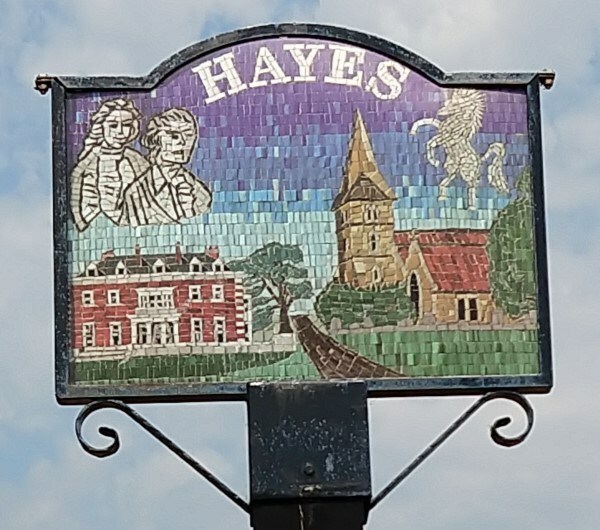 The Hayes Millennium Village Sign was unveiled by the Mayor of Bromley, Councillor John Holbrook, on 23rd March 2002. The features of the sign represent 12th Century Church of St Mary the Virgin, Hayes Place (home of William Pitt the Elder and the Younger and later Sir Everard Hambro), the Pitts themselves, and Invicta, the Kent County Emblem.